Out of so many Calcium supplements available in the market, Calcium aspartate (Clinically proven) is considered a boon for the patients of osteoporosis, arthritis, fibromyalgia, bone spur, joint and cartilage damage as it can be easily absorbed, assimilated and metabolized by the body. By using this product, pain level will reduce continuously while joint cartilage is being repaired and the spurs gradually shrink. Why Calcium Aspartate is better than other ordinary calcium supplements? ●	Calcium aspartate is well shielded by l-aspartic acids and will not precipitate and become more bioavailable like inorganic minerals. It becomes soluble in the luminal fluid of the small intestine at pH of 7.0-7.2. As a result, Calcium aspartate commands an unmatched 92% absorption rate, 3-9 times higher than that of calcium carbonate or calcium citrate. ●	It increases bone density by stimulating osteoblast activities and enhancing collagen production. ●	It corrects bone spurs, arthritis and fibromyalgia by raising bone, joint and muscle metabolism. That's why it's so effective. ●	It doesn't need stomach digestion and has extended calcium absorption to the entire length of small intestine. Calcium aspartate also prevents gastrointestinal distress. It does not contribute to magma precipitation, does not cause stomach discomfort, and does not promote formation of stones in the small intestine or kidney. ●	Many compounds commonly found in foods, such as carbonates, phosphates, oxalates and phytates, attach themselves to inorganic calcium to form insoluble precipitates, which further reduce the absorption of calcium in the small intestine. It maintains its chemical integrity against the onslaught of these compounds and remains bioavailable. ●	Unlike traditional calcium supplements, Calcium aspartate also helps protect vitamin stability. It is well shielded by bonded organic ligands and will not come in contact with vitamin molecules, thus protecting vitamins from oxidation and degradation. 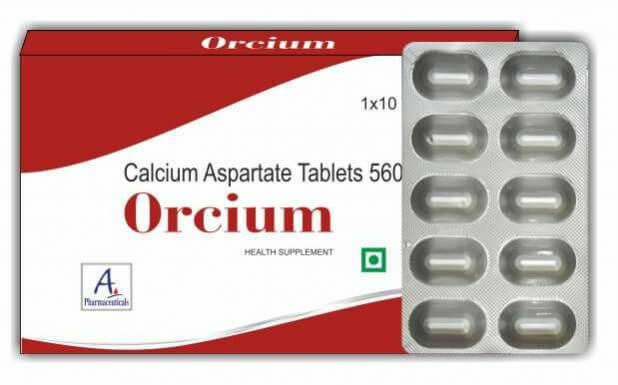 Calcium Aspartate is a bio-available soluble complex of Calcium l-Aspartic acid. It is a highly soluble form of calcium, formed by binding calcium and aspartic acid (an amino acid), providing better absorption, assimilation and usage. Aspartic acid is an important amino acid that functions as a transport mechanism delivering the calcium to proper body sites for specific functions. This form of calcium is readily absorbed by the body and has the dual advantage of releasing calcium and aspartic acid in the blood. It is easily absorbed, assimilated and utilized. Building bones and teeth: Calcium gives their strength and hardness. Although bones appear to be rock hard and static, in reality, bone tissue changes constantly as calcium (and other minerals) move in and out – a process called remodeling. Controlling muscle function and maintaining the heartbeat: Muscle tissue especially the heart, require small amounts of calcium in order to contract and relax normally. Transmitting nerve impulses: Calcium is needed in order for a nerve cell to transmit its messages to other nerves or to muscles. In addition, calcium inside cells transmits messages to special receptors. Promoting blood clotting and wound healing: Calcium is one of fourteen essential factors that are directly involved in the formation of blood clots and start the process of wound healing. Miscellaneous other functions: Acts as a coenzyme in various metabolic activities, controls the permeability of membranes to allow nutrients to pass through cell walls, and helps synthesize hormones and enzymes necessary for digestion. Aspartic acid is a metabolic intermediate in several biochemical pathways in the body, including the tricarboxylic acid and urea cycles. Aspartic acid salts are believed to be mineral transporters to the metabolizing cells, aiding in the metabolic process by replenishing vital electrolytes thereby contributing to efficient energy production. In addition, the aspartate moiety is reported to reduce oxygen consumption by the cells during the energy cycle. Calcium Aspartate promotes calcium absorption in the intestines and retention at the kidneys, thus increasing serum calcium levels. It also increases renal tubule phosphate resorption consequently decreasing serum phosphatase levels, PTH levels and bone resorption. ●	In some cases, may cause constipation, bloating, gas, flatulence, abdominal pain, thirst, polyuria, confusion and delirium. ●	Those at risk of Calcium containing kidney stones are generally adviced not to take supplemental calcium.